Mochi is a delicacy in Japan made from glutinous rice and its popularity goes beyond the shores of Japan as countries like Taiwan and Singapore also enjoy a variant of the mochi known as “mua chee”. While it is also a common omiyage (travel souvenir) all year round, mochi is traditionally eaten around the Japanese New Year which means that mochi making festivals (mochitsuki matsuri ・餅つき祭り) are usually held in winter. 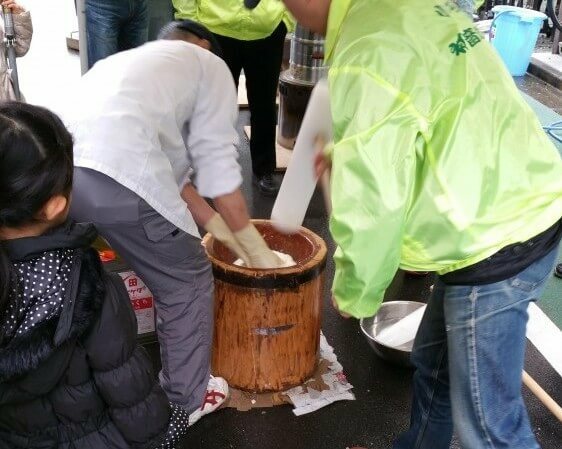 A small-scale mochitsuki street festival in Koishikawa, Tokyo, where children are taught the basics of mochi-making. 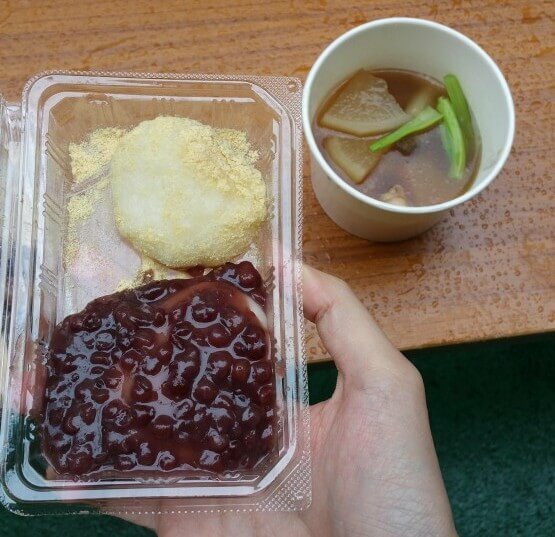 The end product, in this case eaten with either with kinako (yellow soybean powder) or azuki (red bean). Nothing like a hot cup of daikon soup in winter too! You can see a short video of the process of mochi pounding, which is done to smoothen its texture and give it the extra stickiness. Such festivals are aplenty in winter. Check one out if you can as the mochi are given away for free!